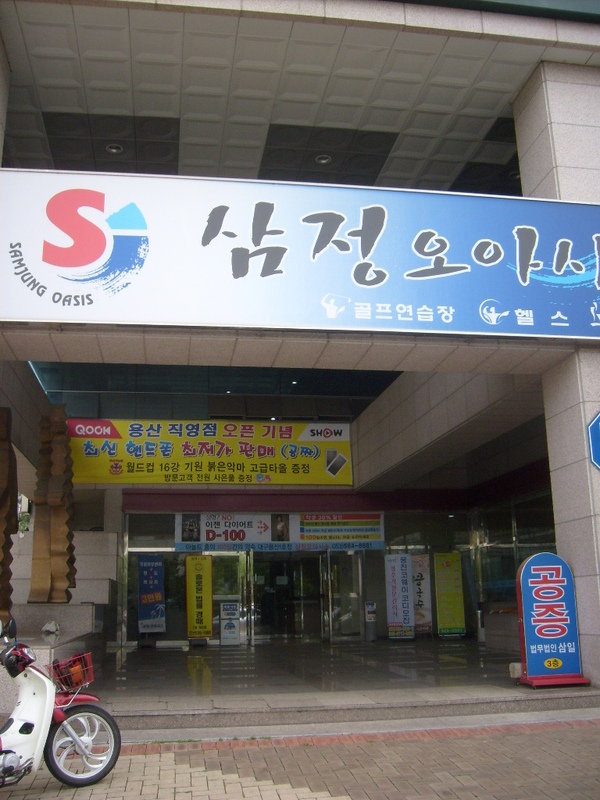 Samjeong Oasis – Lotte Castle (용산동) Daegu. First visited August 14th August 2010. Last visited July 2nd 2012. This is a relatively new and very pleasant bathhouse with an adjoining health club located on the edge of the prestigious Lotte Castle Apartments. I have visited here several times and it is very clean. This is a good bathhouse to take a nap in as it has a pleasant raised sleeping area down the far wall and also a large sauna room in which the TV is located. This room is fairly humid and you can easily nod off laying on the floor. Next to this is a steam room with very high humidity. The steam must be pumped in or the boiler situated behind a wall as I didn’t see one. Personally, I love the enormous cauldron that bubble away in a corner and hiss out bursts of steam. A smaller sauna with no humidity has a jade studded ceiling and the television in the adjacent sauna can be viewed through a window. There are three central pools, basically a warm pool in the center with a hot pool at one end and a pool in which you lay and press a button to have jets of water squirted onto you spine and legs, at the other. The hot pool temperature varied between 38 degrees and 44 and it heated very quickly. This pool is at the hot and of the spectrum. Conversely, the large cold pool, is colder than some other bathhouses. For my friend, this is his favourite local bathhouse with Migwang coming second. Personally, I prefer Migwang. Samjeong Oasis is certainly a great place to relax and nap but I find it a little bright and find the rectangular and very open plan, a little dull. Times – Unsure of timings but I believe the bathhouse is closed on Tuesdays. 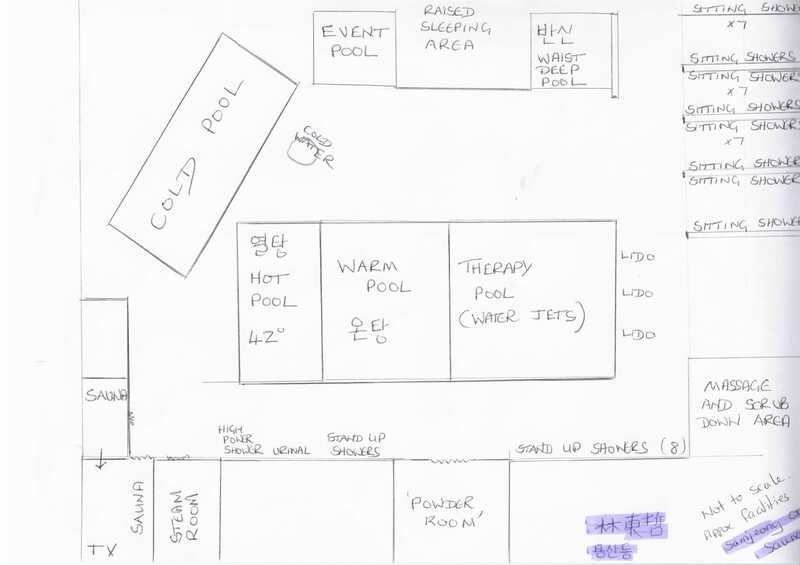 Facilities – ground floor ticket booth, women’s bathhouse, men’s bathhouse, health club. Bathhouse (men) – around twenty stand up shower facilities and fifty sitting down shower units, event pool, (이벤트탕), hot pool (열탕), large warm pool (온탕), large cold pool (냉탕), therapy pool, steam room, jade sauna, humid sauna with television, heated sleeping area. Changing room with television and benches. Others – massage and rub downs, shoe shine, health club, smoking room. Many nearby restaurants and shopping facilities. Ambiance – relaxing, brightish, somewhat open planned and symmetrical. New and very clean. Waygukin – Only my second visit but no foreigners. A lovely spacious bathhouse done in a similar vein to the Migwang Spolex. I do agree with you though Nick – the Migwang is my favorite. For some reason it just has a more relaxing vibe. Saying that, it is not a place I like to visit on Sunday afternoons hence my trip to the Samjeong Oasis. The sauna rooms were decorated well with jade and other crystals. Well worth a visit if your in the area.